Digital surrogates from the Boris Balinsky Memoirs, contain digitized copies of Balinsky's typewritten memoir. 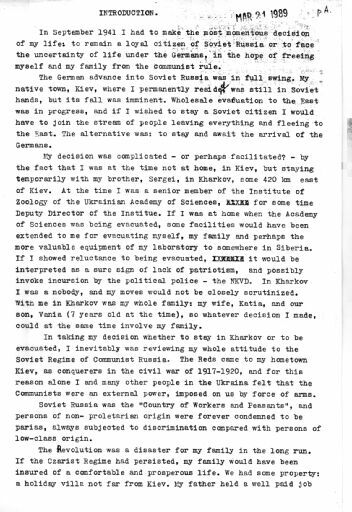 Digitized materials are divided in files arranged according with topical areas covered in the original document: introduction; childhood; russian civil war; Balinsky's studies on entomology and family matters; imprisonment of his wife Katia; his life in Kiev, in Germany, and in Scotland; his experience at Munich at the University of United Nations Repatriation and Rehabilitation Administration; the role of music in Balynsky's life; the beginning of his scientific career; the period of his life he calls "Years of prosperity"; families Stengel and Gruber; Family Syngayevsky; and other Travels. Memoirs cover a period approximately form 1905 to 1949. The Boris Balinsky Memoirs (Digital Surrogate), 1988 are managed by the University of Illinois Archives and do not feature precise descriptive information for each item. Discover their contents by browsing the folders and files. For more information, contact an archivist at illiarch@illinois.edu.